To start a blog with Blogger, visit the Blogger homepage, enter your username and password, and click Sign in. Enter a display name (e.g you can type one of your names) and accept Blogger's Terms of Service. Then click the Create a Blog link and get started! Pick an address (URL) and a blog title of your choice, you can read what is Blog, what is Blogging and who is Blogger, to be well guided. 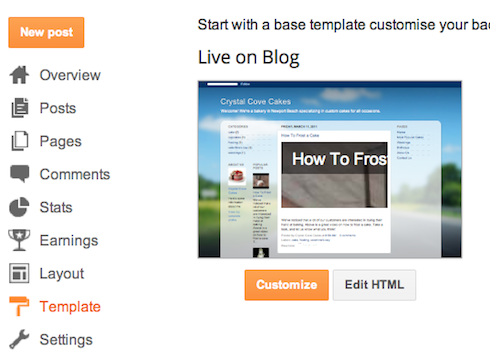 Then, choose your favorite blog template (this is how your blog will look when you publish it). Now get creative, add information to your personal profile, and customize how your blog looks, if you feel up to it, click save. Start blogging now! 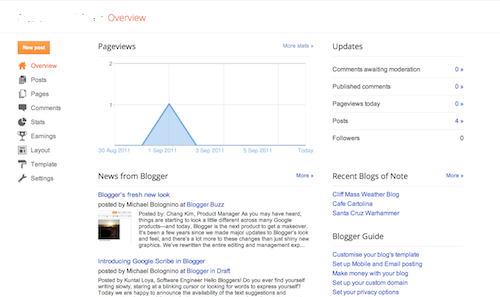 · Writing a new post: Just click on the orange Pencil icon on your Dashboard to access the Post Editor. · Viewing your posts: The gray Post List icon will take you to a list of your published and drafted posts for a specific blog. · Catching up on your favorite blogs: Below the list of your own blogs, you’ll see a list of the blogs you follow with an excerpt from their latest posts. 1. Click the orange pencil icon to write a new post, and enter anything you want to share with the world. 2. Next, you'll see the Post Editor page. Start by giving your post a title , then enter the post itself. 3. When you're done, click the Preview button at the top to make sure it's ready to go, and then click the Publish button to publish your post. · The 'Left', 'Center', and 'Right' options allow you to customize the way your blog text will flow around your image. · The 'Image size' options will determine how large the image will appear within your post. Your template is a fun way to customize your blog. When creating a new blog, you're first asked to choose a default template, this is the basic design of your blog. You can choose from many templates for your blog; simply pick the one that best fits your needs. Once on the Template tab, you can either click on the orange Customize button to get started with our easy-to-use WYSIWYG (“What you see is what you get”) template designer, or choose one of our many default templates. If you’d like to edit the HTML of your blog, just click the gray Edit HTML button. 1. 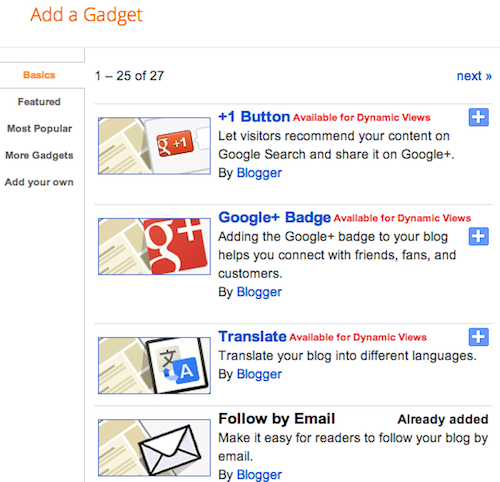 Click Layout from the drop-down menu on your dashboard below the blog you would like to customize. 2. From there, click Edit to edit existing gadgets, or Add a Gadget to add new ones. 3. To add a new gadget after you've clicked Add a Gadget, simply click the plus sign next to your desired gadget. You can choose from gadgets by category, or search for a specific gadget in the top right of the pop-up window. 4. Once you've added the necessary information to your selected gadget, click the orange Save arrangement button. Your layout changes will appear instantly.